I've been busy this week preparing for a 9-day trip into Alaska's Katmai National Park. As part of the process, I've been prepping one of my longest-serving tents for what may be some particularly harsh elements. I expect wind, rain, and quite possibly some blowing volcanic ash as we head into the Valley of Ten Thousand Smokes, which was buried under dozens of feet of ash during the 1912 eruption of Novarupta. For this particular adventure, it's essential that my tent be as wind- and rain-proof as possible. Key to this are the tent guylines. Guylines do two important things: 1) Provide increased strength in wind, and 2) Tension the rainfly so that it does not sag into the tent body and cause leaks. So here are some tips and advice from a wise guy-liner. Haha. 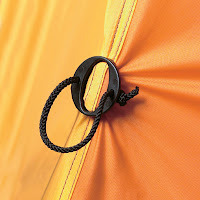 1) Most tent rainflies incorporate a series of loops, or guy points, for securing lines to the rainfly. This is great, except that what you're trying to do is actually connect the guylines to the tent poles, which provide the structural stability that you're trying to reinforce. For this reason, most tents also include some method to attach the underside of the rainfly to the poles at the guypoints. This is usually a velcro loop that you secure around the pole, though heavy-duty winter tents (like Mountain Hardwear's Trango series) feature plastic clips that are stronger and easier to secure to the poles. So if you're trying to maximize the strength of your tent, be sure to secure these lash points. 2) There's a caveat to point #1, however. These days, most rainflies are seam-sealed at the factory, which means that no water is going to leak in through the seams. But look closely at the velcro lash points mentioned above. Oftentimes they are not sealed, or the stitching creates an opening, or the seam sealer around its base comes loose. Upshot being that water can wick down the velcro from outside and then drip down the poles or into your tent. Evaluate these closely; apply some additional seam sealer if necessary. 3) Guylines are strongest when they are at a 90-degree angle to the pole. This is hard to do in most camping conditions, unless you've got a tree nearby to tie to or are setting up a winter tent in a dug-out area in the snow, with snow walls surrounding you. So the general rule of thumb for maximizing strength is to stake out the guyline as far from the tent as possible to get the angle as close as possible to 90 degrees. 4) Guylines can be hard to notice when you're walking around camp, making them easy to trip over. Reflective guylines are nice during the night. During the day, consider hanging something over guylines to alert others (and yourself) to their presence (a T-shirt, jacket, bandanna, etc. ), or place gear in front of it to create an obstacle. 5) Tripping over a guyline can also exert so much force that the actual guypoint will rip out of the rainfly, especially points along the lower edge of the tent. I've done it. This is problematic to fix, since guyloops need to be stitched in to the fly for strength. The best fix I've found for this are Sierra Designs Grip Clips, which allow you to securely attach a guypoint using only the fabric; a male and female piece lock together on either side of the material. No puncturing or sewing required. 6) You need to be able to adjust the tension of your guylines. Rainflies become saggier or more taut depending on whether it's cold and wet (saggy) or hot and dry (taut). Many tents come with the basic, and common, adjuster piece: a narrow piece of plastic with two holes. The guyline is threaded through one, then out the other with its end secured with a knot so that it doesn't slip back through; the length of line between the two holes can be extended out to for m a loop. These work OK, except that once the line is reasonably taut, it becomes hard to slide the line through the tensioned plastic. 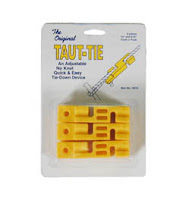 My favorite are small Taut-ties, little yellow blocks with grooves for the lines that allow you to adjust tension much, much easier. 7) Keep the rainfly away from the tent body! One of the main reasons that tents leak is because a wet rainfly sags into the tent body and rubs off its condensed moisture. Make sure to attend to any part of your tent that is vulnerable to this; large areas of fabric between poles are particularly vulnerable.